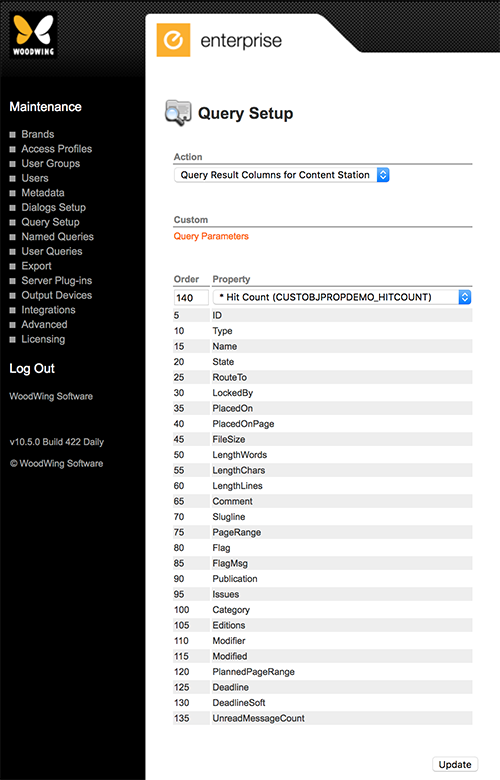 When a user of Content Station or Smart Connection searches for files in the Enterprise database and views the results in List View mode, the user can choose to see various columns in this list. Each column represents a property of a file such as name, Workflow Status, and modified date. Which columns the user can choose from is configured in Enterprise Server. Note: Client applications such as Content Station and Smart Connection can add their own required properties or hide properties that are not supported by that client. The actual properties that are shown to the end user might therefore be different than those that are configured here. Step 1. Access the Query Setup page in Enterprise Server. 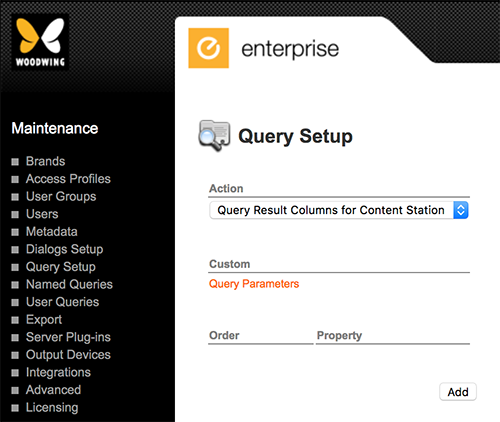 In Enterprise Server, click Query Setup in the Maintenance menu or on the Home page. Figure: The Query Setup page of Enterprise Server. Step 2. From the Action list, choose for which client you want to set up the query. Query Result Columns Columns shown in all clients when none of the below options are configured. Query Result Columns for Content Station Columns shown in Content Station. Query Result Columns for InCopy Columns shown in Smart Connection for InCopy. Query Result Columns for InDesign Columns shown in Smart Connection for InDesign. Query Result Columns for Planning Columns shown in 3rd-party planning applications. Step 1. Access the Dialog Setup page in Enterprise Server. In Enterprise Server, click Dialog Setup in the Maintenance menu or on the Home page. 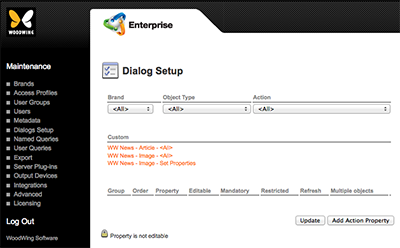 Figure: The Dialog Setup page of Enterprise Server. Step 2. Make sure that Brand and Object Type are set to <All>. Note: The selection will automatically change back to 'All' for both Brand and Object Type when a choice is made from the Action list. Step 3. From the Action list, choose for which client you want to setup the query. The title of the page changes to Query Setup. Step 4. Click Add Action Property. Fields for adding a property appear. Step 5. (Optional) In the Order box, enter a number that specifies the order in which the property should appear in the list. Step 6. From the Property list, choose a property that should be available in the list. 12 April 2019: Updated section 'Steps for Enterprise Server 10.5 or higher' by adding information about Enterprise Server 10.5.2 to the notes for the 'Order' option. 20 September 2018: Updated section 'Steps for Enterprise Server 10.0 – 10.4' by adding step 2. and the note that follows it.